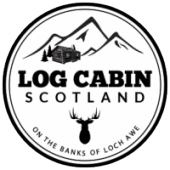 We specialise in traditional log cabins with hot tubs holidays in Scotland. Our lodges are made to the highest Scandinavian standards and sit in large plots of land (either woodland or on the loch shore) in the Loch Awe Forest Park. Originally created by the Forestry Commission these exclusive log cabins are secluded and unbelievably peaceful and will create the perfect atmosphere for your log cabin holiday in Scotland. Loch Awe is Scotland’s longest freshwater loch. Its gentle shores are fringed with impressive conifer forests and gorgeous old oakwoods carpeted with mosses, ferns and wildflowers in summer. The forest wildlife here is varied and incredibly rich, home to red deer, red squirrels and golden eagles to name but a few. Spend a week exploring the waterfalls, hill lochs, crannogs, picnic sites and miles of waymarked trails and forest roads, and you’ll still have plenty more to see. The highlands of Scotland is a fantastic place to bring our furry friends and here at Log Cabin Scotland we are very dog friendly. Our cabins are all located in a very quiet and tranquil area on the shores of Loch Awe and are ideal for dog walking and relaxing and exploring with your four legged friend. Well behaved and sociable dogs are always welcome.